The Law Offices of Steven R. Dolson, PLLC is a regional law firm focused on consumer bankruptcy matters and obtaining Social Security Disability (SSD) and/or Social Supplemental Income (SSI) for clients located within the geographic area of Upstate New York. 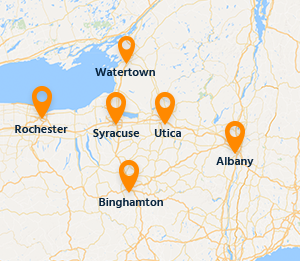 Centrally based in Syracuse, New York, the Social Security disability lawyers from our office travel to conveniently located satellite locations in Albany, Binghamton, Utica, and Watertown to meet with and advocate for our clients. We also regularly appear in the Bankruptcy Court proceedings in Albany, Binghamton, Rochester, Syracuse, Utica, and Watertown on behalf of debtors who have sought the protection of the Court to deal with overwhelming debt. The firm was originally founded in 2005 following Congress’s drastic overhaul of the Bankruptcy Code by its’ namesake and founding attorney, Steven R. Dolson, Esq. The firm’s reputation for zealous advocacy, fair pricing, and exceptional customer service allowed it to grow substantially in the following years and in 2011 the firm was incorporated. Today we’ve grown to one the largest consumer bankruptcy firms in Upstate New York and rival national Social Security Disability firms in the number of claims filed regionally. This size has allowed us to fight for our clients with the resources necessary to take on big banks, mortgage companies, and even the federal government. Despite our growth over the years, we have worked hard to maintain a hometown feel with representation specifically tailored to meet each of our client’s needs. Each of the attorneys within our office has had personal experience with close family members dealing with disability and the effects that it can have on a family. Knowing just what is at stake motivates our firm on a personal level to strive for the best possible results for our clients. The Social Security Administration oversees two separate disability programs. For both programs an individual must be unable to perform substantial gainful activity (SGA) as a result of severe mental or physical impairment that is likely to continue for twelve (12) months or result in the death of the person. Substantial Gainful Activity is a legal term used by Social Security and references a specific dollar amount that changes year to year based on cost of living increases. For 2017 this amount is $1,170.00 for a non-blind individual and $1,950.00 for a blind individual. The first disability program is known as Social Security Disability (SSD) or Title II. This program is for workers who become disabled, their widows, or children. To qualify for SSD benefits a person must accumulate enough quarters of coverage by working for specific time periods prior to becoming disabled. Workers purchase these quarters of coverage through payment of payroll (F.I.C.A.) taxes. A disabled widow can draw on a deceased worker’s earnings if the worker was insured at the time of death, the disability of the widow occurred within seven (7) years of the worker’s death, and the widow is over the age of fifty (50). A child can collect on a worker’s benefit if they are unmarried and became disabled prior to their twenty second (22nd ) birthday. The second program is Social Supplemental Income (SSI). It is meant to provide support to people with limited financial resources that are disabled. As a result a person must not only be disabled, but must also meet financial criteria to be eligible for SSI payments. Children under the age of 18 years old who are disabled may be eligible for SSI payments as a means of additional assistance to caretakers of disabled children. Family income and property play a key role in determining eligibility for SSI benefits. In order to adjudicate a claim the Commissioner of Social Security has set forth a five-step sequential evaluation process within 20 C.F.R. §404.1520 and 20 C.F.R.§416.920. Our Syracuse Social Security Disability Lawyers know this process very well and assist our clients in navigating it step by step. The Bankruptcy Code can be found in Title 11 of the U.S. Code and is organized into Chapters. Individuals are generally eligible to file for relief from their debt under Chapter 7, Chapter 11, and Chapter 13. The most common type of filing is a Chapter 7 bankruptcy. Within the Syracuse Bankruptcy Court, lawyers file more than 75% of cases under Chapter 7. Chapter 7 is commonly referred to as a total bankruptcy, complete bankruptcy, or liquidation bankruptcy. In a Chapter 7 a trustee is appointed, who attempts to find assets that can be sold to pay down debt. Individuals filing for Chapter 7 are allowed to claim property that they own as exempt under a complicated interplay of state and federal law. Exempt property may not be sold by a trustee to satisfy the claims of creditors. As a Syracuse bankruptcy lawyer, we’ve successfully claimed and expanded the definitions of these exemptions in cases within the Upstate New York area. The entire process of a typical Chapter 7 usually takes about 3 to 4 months to complete, but can take longer. Eligibility for Chapter 7 relief is dependent upon several circumstances, including but not limited to, income, residence, prior filings, and good faith dealings. Chapter 13 bankruptcy is a repayment type of bankruptcy. In order to be eligible a person must have disposable income to pay creditors a meaningful amount. A trustee is appointed to accept payments and distribute them. People generally file for Chapter 13 because they make too much money, are trying to deal with mortgage payments, owe income taxes, can not file a Chapter 7 because of prior filings, have non-exempt property, or are trying to adjust a car loan. Chapter 11 is a re-organization bankruptcy. It is primarily filed by businesses, however, individuals are also allowed to file a chapter 11 bankruptcy. In a chapter 11 the debtor proposes a plan of re-organization that must be voted on by parties in interest. The debtor is responsible for the administration of the plan and the Court will hold a hearing to confirm it's contents. We serve clients throughout New York including those in the following localities: Albany County including Albany; Broome County including Binghamton and Endicott; Jefferson County including Watertown; Oneida County including Rome and Utica; Onondaga County including Baldwinsville, Liverpool, and Syracuse; Oswego County including Fulton and Oswego; Rensselaer County including Troy; Schenectady County including Schenectady; and Tompkins County including Ithaca.